There is a possibility that I've made a few mistakes. However, I tried to accurately harvest this data from Trang's blog and Jim Breen's Wiki. Contact me via tatoeba.org/eng/private_messages/write/CK with corrections or additions. This is a multilingual dictionary. A Wikipedia type of thing, except that people add sentences, not articles. The aim : to build a large database of sentences translated into various languages that everyone can access for free. This "dictionary" is soon going to be hosted on my university server. www.manythings.org/corpus started using the Tanaka Corpus that was being maintained by Jim Breen and Paul Blay. Some of the very low numbered sentences, I think, were not part of the Tanaka Corpus. Previous log data was lost with migration. All dates set to unknown. However, for a few thousand sentences author names were retrieved and added. 330,000 sentences - 150,000 in English, about the same in Japanese and 24,000 in French. The original 24,000 French sentences came from Tokidoki (http://tokidoki.fr/ - currently offline) and were given to the Tatoeba Project. The project moved to a new server and started using the domain name tatoeba.org. Kakashi Japanese-to-Romaji converter re-implemented. However, it's far from perfect. For the record, there are currently over 150,000 sentences in English and Japanese, and about 24,000 French translations for these 150,000 sentences. Originally started with sentences from the Tanaka Corpus which had 212,000 sentence pairs. These were cleaned up quite a bit by Jim Breen and Paul Blay before being imported into the Tatoeba Project. The French translations that were given to me were the result of the work of 80 volunteers. Trang says: So the concept is : we gather a lot of data, try to organize it, ensure it is of good quality and make it freely accessible, downloadable and redistributable, so that anyone who has a great idea for a language learning application (or a language tool) can just focus on coding the application and rely on us to provide data of excellent quality. Jim Breen starts using the Tatoeba Project to maintain the version of the Tanaka Corpus being used by WWWJDIC. On February 13th we went to an event organized by an association based in Paris called Shtooka (http://shtooka.net/ - currently offline). Trang blogs the first time about the Tatoeba Project policies for contributions. In addition to the Google auto-detect language, users can now choose the langauge for a submission. Only sentence being translated is now shown to prevent new contributors from adding the translation to the wrong sentence. Chinese sentences are now displayed both in traditional AND simplified. It was announced that a pinyin converter and conversion between simplified/traditional Chinese were added. Pagination of the Wall and latest messages shown on the main page. Pages with just comments's on one user's sentences were added. Pages with just one user's comments added to profiles. Switched to MeCab for handling Japanese Fugigana and Romaji. Romaji now only shows up on mouseover rather than being displayed on the page. Duplicate sentences to be merged and better looking private messages. Trang blogs for the first time about how to improve the reliability of the sentences. Trang talks about the idea of members "voting" on whether a sentence is accurate or not. Trang talks about the possibility of "locking" a sentence once it's considered completely reliable, so even the owner can't change it. Downloadable files are now updated every week. Contributors can now edit and translate sentences directly from a list (as well as adopt, favorite and add to another list). Indirect translations are taken into account in the search. Edit/Show pages for lists. Edit: for editing, translating sentences from the list. 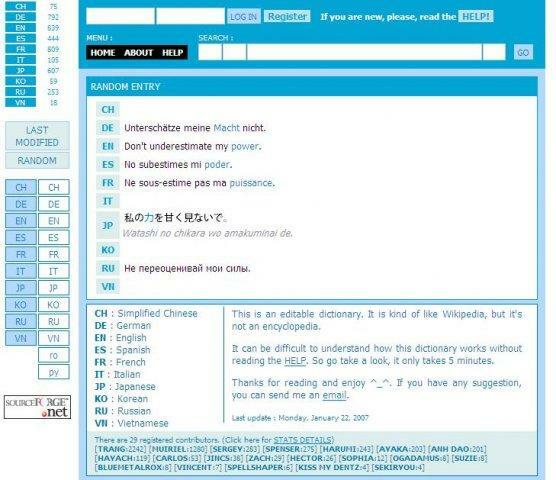 Show: simply for viewing the sentences and listening to them. Pagination in lists (so that it won't take forever to load long lists). Possibility to specify language of next and previous links in "Browse" section. Trang discusses the role of "moderators" (now called "corpus maintainers"). We simplified the registration process. Tags were introduced. (Restricted to "trusted users" (now called "advanced users"). For example, unsafe (to mark sentences that can cause problems, are not suitable for kids, etc). Page that lists all the tags. The capability to import single sentences or sentence pairs from a text file was added. Contributors should ask one of the admins to do this for you, if you want to contribute this way. Write to team@tatoeba.org. Allan Simon publishes a short article about the Tatoeba Project titled Tatoeba.org, base de données de phrases d'exemple. "We currently have over 400,000 sentences covering 53 languages ​​and about 4,000 audio files." Japanese furigana now displayed properly above each kanji. You now have the possibility of displaying comments only on sentences in a certain language. 3,465 sentences were added on one day (the record, at the time). Autocompletion of tags was introduced. Tags now organized by popularity. The Tatoeba Project is now supporting a total of 71 languages. Tatoeba Day#1 - Top 3 languages for the day were Arabic (573) Esperanto (354) and German (247). New "Member's Page" which displays much more quickly. No last login. "Currently contirbuting" is limited to members contributing the last 400 sentences. Owner's name is now displayed on the homepage comments. "Moderators" (now called "corpus maintainers) can now see a list of sentences tagged more than 2 weeks ago. You can now see Wall posts of just one member. "If there is one thing you will need to remember, it is this: do not add non CC-BY sentences in Tatoeba." We've added a page that lists all the sentences of a user, but with the sentences options (translate, adopt, favorite, etc). This is primarily to make it a bit easier to translate sentences of a specific user. We've stabilized the language of the interface. If your interface is in Chinese, and you click on a link where the language is set to Esperanto, you shouldn't see your interface change to Esperanto anymore. Tatoeba Day #3 stats were announced: The top 3 were Shishir (218), brauliobezerra (117), CK (108) It was a day concerned with linking. The languages of the sentences are indicated in the comments (on the homepage and the comments pages). Translations are now ordered by language (based on the ISO code). For people who use our data, there is a new file that you can download: sentences_detailed.csv. This file contains additional information about the sentence: the contributor who "owns" the sentence at the time of the export, the date when the sentence was added and the date when it was last modified. The activity timeline page now only displays the number of sentences added for each day in the current month. You can however browse to see the activity for other months. That was in the attempt to make this page a little bit faster to display. You can filter your private messages to only display those that are unread. lists.csv was added to the weekly exported files. Generated from the sentences_detailed.csv file. * 1,953,634 (66.58%) of these are by identified native speakers. 2,432 sentences with no language identified. 0.08% have no language identified. 2,533,193 sentences in languages with identified native speakers. 72.12% sentences in languages with identified native speaker are by identified native speakers. 66.58% of all sentences are by native speakers. 400,150 sentences in languages with no identified native speakers. * 308,518 (77.10%) of these are Esperanto. 231 usernames have contributed over 1,000 sentences. 921 usernames have contributed 100 to 999 sentences. 596 usernames have contributed 50 to 99 sentences. 2,065 usernames have contributed 10 to 49 sentences. 933 usernames have contributed 6 to 9 sentences. 6,417 usernames have contributed 1 to 6 sentences. ## in CK's Subset of 272,765 "English Sentences to Use"